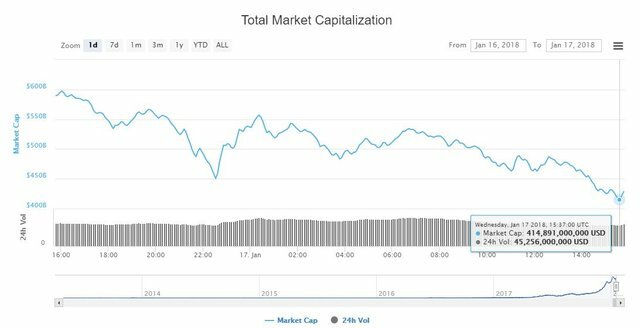 Since reaching that low point, though, the cryptocurrency market cap has experienced a 10 percent recovery and is currently valued at $458 billion. An examination of the charts demonstrates that while cryptocurrency prices remain firmly in the red for the day, all major coins have returned strong performances over the past hour. The bitcoin price is currently trading at a global average of $10,116, representing a one-hour gain of six percent and a welcome recovery after following a sub-$10,000 dip earlier in the day. Bitcoin now has a market cap of just over $170 billion and is down 15 percent for the day. The ethereum price made a nine percent climb, although it remains well below the $1,000 barrier and its market cap will need a $17 billion boost to return to $100 billion. Third-ranked ripple saw a 10 percent increase that raised its price to just above dollar parity, a mark it had slipped below this morning during today’s 25 percent skid. Nevertheless, the ripple price is still down 49 percent for the week, which is worst among top 10-cryptocurrencies. Bitcoin cash, meanwhile, rose eight percent to $1,529 but, like most top-tier coins, continues to trade more than 20 percent below its previous-day level. Cardano and IOTA performed slightly better, rising nine percent in the past hour, while litecoin, NEM and, stellar all leaped by at least 11 percent. The NEO price’s 20 percent rally to $116 was best among top 10-cryptocurrencies, as was its relatively-mundane weekly decline of four percent. 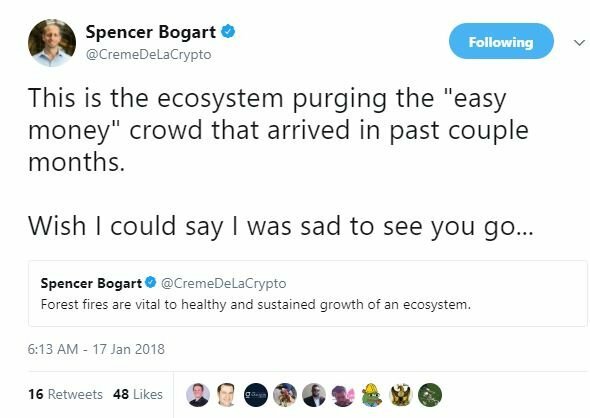 While cryptocurrency skeptics will likely rush to publish a new series of bitcoin obituaries, the consensus among long-time market observers is that this correction — though severe — is healthy for the market.Spencer Bogart, a partner at cryptoasset hedge fund Blockchain Capital, compared the pullback to a forest fire, which is both destructive and necessary for the sustained growth of the ecosystem. He predicted that the market will purge the “easy money crowd” that joined the markets during the fourth quarter run-up and invested based on pure speculation rather than appreciation for the potential of the underlying technology.“Wish I could say I was sad to see you go,” he said. Thank you @gentstudent for making a transfer to me for an upvote of 8.66% on this post! Half of your bid goes to @budgets which funds growth projects for Steem like our top 25 posts on Steem! The other half helps holders of Steem power earn about 60% APR on a delegation to me! For help, will you please visit https://jerrybanfield.com/contact/ because I check my discord server daily? To learn more about Steem, will you please use http://steem.guide/ because this URL forwards to my most recently updated complete Steem tutorial?